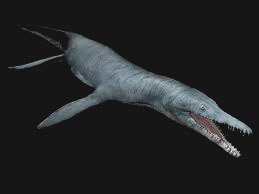 Measuring an estimated 33-43 feet long, Kronosaurus is the second largest reptile to ever live in the sea (the “Monster” beat him in 2008). This creature had amazing size and strength and would strike fear into anyone. Kronosaurus “Krono” had a very large head (nine feet long), so large that if scaled down to our size our heads would have to be nearly two feet long. This large head contained a huge mouth with very specialized teeth.